I’ve serving up a Swissy + chart pattern double special in today’s intraday chart update, with a triangle on CAD/CHF and a channel on EUR/CHF on today’s menu. Is CAD/CHF in for more downside moves? Well, there’s currently a higher-than-average chance that the pair may move lower. 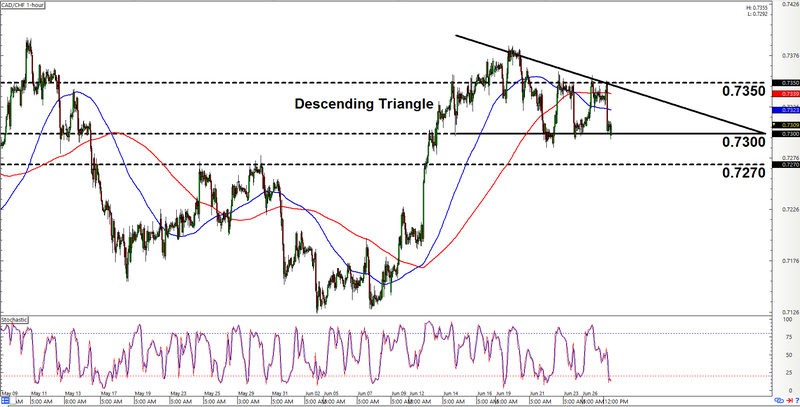 After all, a descending triangle has recently formed on CAD/CHF’s 1-hour chart. As the name suggests, a descending triangle is a bearish chart pattern, so we’re lookin’ mainly to short the pair. And should the pair break to the downside, then the resulting selloff may have enough steam for at leas a 90-pip move. The pairs needs to clear 0.7270 on strong bearish momentum to validate the breakout, though, so don’t chillax right away if the pair breaks lower and you found an opportunity to short. Also, a descending triangle usually forms at the end of a downtrend. This one, however, formed at the end of an uptrend. As such, there’s also a slim chance that the pair may break to the topside instead, so y’all may wanna think about bailing yo longs, or even switching to a bullish bias, if the pair flies past 0.7350. 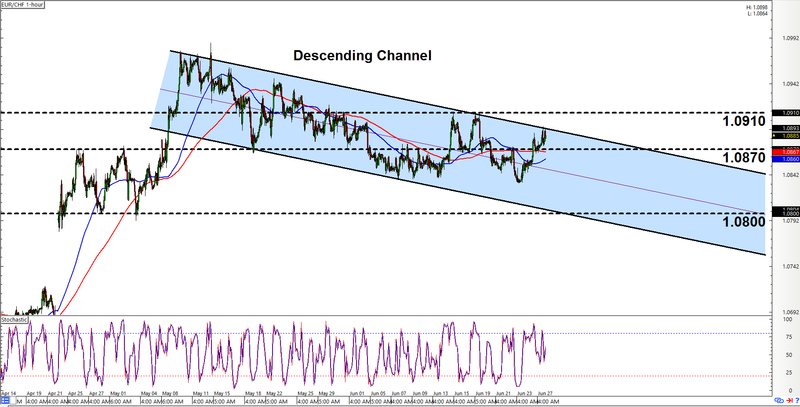 EUR/CHF has been trading ever lower while trapped in that there descending channel, as y’all can see on that there chart. And presently the pair is testing the channel’s resistance area. Also, stochastic is moving back down again after having reached overbought territory. Y’all may therefore wanna start lookin’ for opportunities to go short on the pair. The only worrying thing here is that the pair has been closing above them moving averages and the area of interest at 1.0870, since that’s a sign that bullish interest is strong. As such, y’all may wanna prepare for a possible upside break as well, although bulls need to take out 1.0910 to validate an upside channel breakout. Also, y’all may wanna wait until the pair clears 1.0870 before shorting. Anyhow, if the pair moves back down again, then bears will likely be gunning for 1.0800.